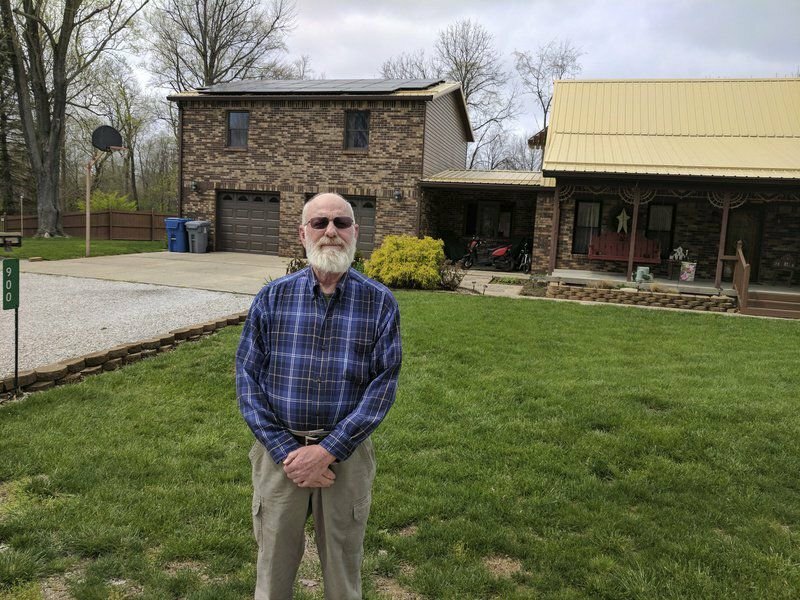 Tribune-Star/Jane Santucci From coal to solar: Stephen Scott, a retired utility company worker, has converted his home to solar power. After working 42 years for the Public Service Co. of Indiana, known today as Duke Energy, Stephen Scott knows a thing or two about electricity. Scott cautions others about the challenges our nation faces as temperatures rise and the demand that poses to our grid. He has done his part by installing solar on his home. By doing so, he has reduced the amount of electricity he needs from the grid and can also supply his excess back for others to use. As summer approaches, pay attention to the news and talk about heat waves in cities throughout the United States. Scott says there is a process called wheeling power in which large generation corporations have the ability through their transmission lines to transmit power across state lines and across entire regions to where it is needed most. For example, if there is a heat wave in Tennessee, and we are sitting here in Indiana with mild 80-degree temperatures, the cost we may pay to generate a megawatt hour is $20. “However, because they need the electricity so bad in these other areas, on the market the cost of a megawatt of electricity can go to $200 to $500 per megawatt hour,” Scott said. During heat waves in other areas, utility companies in Indiana are sitting with what is known as a rolling reserve. It can only take a matter of hours to release some of those reserves. “I am the consumer in Indiana, also a generating facility because I have solar panels. When they sell their power at $300 a megawatt hour, are they going to pay me the multiple factors instead of the wholesale rate of $0.02 as listed in Senate Bill 309?” Scott asks. He refers to Indiana Senate Bill 309, which passed the House and the Senate during the just-ended legislative session. Senate Bill 309 presents a grim future for solar owners and prospective customers. Scott decided to install solar on his home after suffering a lot of physical problems. “I have watched a lot of good fellow employees die very young when they retire. I just wanted to try and make a small little difference in the world. Financially, this does not benefit me,” Scott said. Before installing solar, he paid $310 a month for electricity; now he pays about $160. He still contributes to the costs associated with transmission and distributing power. He did not borrow money to install solar panels on his house. He elected to remove $40,000 out of his 401K retirement fund to invest in solar energy. “I didn’t have to pay federal tax on the $40,000, but I had to pay $2,500 in state tax because there was no state tax incentive because they view that as income,” he said.